Durable Waterproof to 131' (40m): Designed to withstand extreme environments and conditions. Wearable Mountable: Enables immersive self-capture during your favorite activities. Compatible with all GoPro Mounts: 60 mounts and accessories - and counting - for capturing a wide variety of perspective and activities. GoPro App Software: Control your camera remotely. View and share your content. Easily create gorgeous GoPro-style videos. Protune - Now for Video Photos: Cinema-quality capture and manual control of color, ISO limit, exposure and more. Night Photo Lapse: Customizable exposure settings up to 30 seconds for single and Time Lapse Photos. Auto Low Light: Automatically adjusts frame rates for optimal low-light performance. High-Performance Audio: New Audio System captures clean, high fidelity sound and nearly 2x the dynamic range. Ultra Wide-Angle Glass Lens: Enables engaging, immersive footage of you and your world. Selecable FOV: Three FOV settings - Ultra-Wide, Medium and Narrow - allow for a broad range of perspectives. HiLight Tag: Mark key moments while recording for easy playback, editing, and sharing. QuikCapture: Power on and record automatically with the press of a single button. SuperView: Captures the world's most immersive wide-angle field of view. GoPro’s high-end camera model that features a new design with an integrated LCD, significantly increasing ease of use. Store: AT&T Wireless Condition: Brand New Price: $399.00 Total Price: $399.00 Buy It from AT&T Wireless Pro-quality capture. Touch-display convenience. 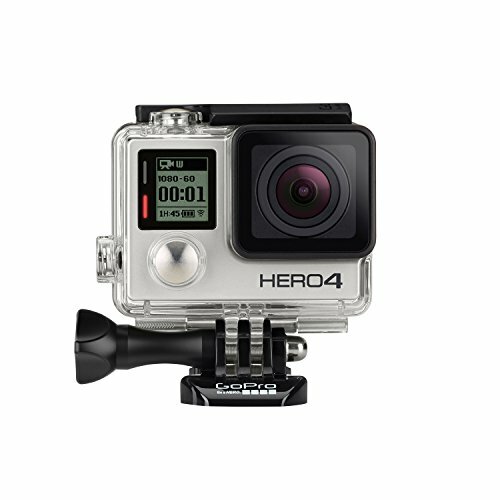 Capture your world in an all-new way with GoPro HERO4 Silver, the first-ever GoPro to feature a. Store: Century Helicopter World Condition: Brand New Price: $219.00 Total Price: $219.00 Buy It from Century Helicopter World No returns. Last updated: April 19, 2019 at 12:05 EST. Pricing information is provided by the listed merchants. GoSale.com is not responsible for the accuracy of pricing information, product information or the images provided. Product prices and availability is subject to change. Any price and availability information displayed on amazon.com or other merchants at the time of purchase will apply to the purchase of the product. As always, be sure to visit the merchant's site to review and verify product information, price, and shipping costs. GoSale.com is not responsible for the content and opinions contained in customer submitted reviews.